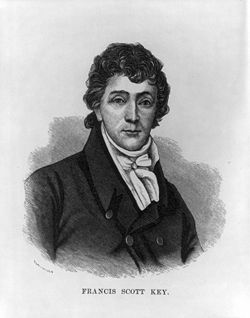 Francis Scott Key (August 1, 1779 – January 11, 1843) was an American lawyer and amateur poet. 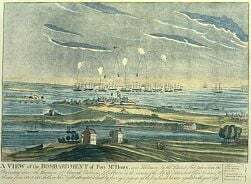 While watching the bombardment of Fort McHenry during the War of 1812, Key realized the British were retreating and he was inspired by the strength of the American flag. He took an envelope from his pocket and began proudly writing a poem that would become the United States national anthem, "The Star-Spangled Banner." He was born to Ann Louis Penn Dagworthy (Charlton) and Captain John Ross Key on August 1, 1779, in western Maryland. His family was very wealthy and owned an estate called "Terra Rubra." Key and his younger sister received their early education at home because there were no schools nearby. At the age of ten he was sent to Annapolis to attend St. John’s Grammar School. He graduated seven years later and went on to St. John’s College, where he graduated at the top of his class. His uncle offered him a position in his law firm while he studied to become an attorney. He started his own practice in Georgetown where he was a well respected. He made his home there from 1804 to around 1833 with his wife Mary and their six sons and five daughters. By 1814, he had appeared many times before the Supreme Court and had been appointed the United States district attorney. He was renowned as a public speaker. Francis was a deeply religious man. He thought of leaving his law practice behind at one point to pursue a ministry life. He instead led an active role in his local Episcopal Church. He received great pleasure from helping people, and even if they couldn’t pay him for his legal services he would still represent them. His family owned slaves; Key, however, thought slavery was wrong—even to the point of taking court cases for slaves who were trying to win their freedom. When the War of 1812 began he was conflicted; he loved his country but was strongly opposed to the war. He served for a brief time in the Georgetown field artillery in 1813. Dr. William Beanes, a close friend of Key's, was taken prisoner by the British. Key was asked to help with his release. He left for Baltimore knowing that the British were in the Chesapeake Bay. Colonel John Skinner, a prisoner exchange negotiator, was waiting for him. Together, they set out to meet the Royal Navy. The British officers treated them kindly. They agreed to release Dr. Beanes but did not allow the three men to return to Baltimore until after the bombardment of Fort McHenry. They were put on a small boat without sails. Without sails, all they could do was sit and watch the British attack. Francis and the two others were located approximately eight miles away and watched the British bombard the fort. The British finally left after 25 hours of continuous bombing. They were unsuccessful in destroying Fort McHenry. Relieved the attack was over, Key anxiously glanced over to the fort to see if the flag was still there. In 1813 the commander of Ft. McHenry asked for a flag so big that “the British have no trouble seeing it from a distance.” After the attack, the giant flag was still flying and against all odds, the United States had won the battle. Key was overwhelmed with pride as he witnessed the victorious flag waving following the British retreat. 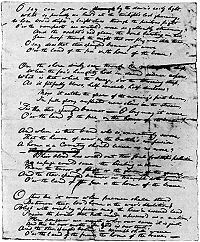 He quickly wrote down the words to a poem, which was soon handed out as a handbill under the title "Defence [sic] of Fort McHenry." It was renamed "The Star-Spangled Banner" and became a popular patriotic song. The United States Army and Navy chose the song as their official song, and in 1916, President Woodrow Wilson declared that the song should be played on all official occasions. However, it was not until 1931, that it became our national anthem under a Congressional resolution in 1931, signed by President Herbert Hoover. After the war, Key continued to work as a lawyer and was an active and supportive member of the community. Key died at the home of his daughter Elizabeth and her husband Charles Howard on January 11, 1843, in Baltimore from pleurisy or lung cancer. He was initially interred in Old Saint Paul's Cemetery in the vault of John Eager Howard. In 1866, he was moved to his family plot in Frederick at Mount Olivet Cemetery. The Key Monument Association erected a memorial in 1898 and the remains of both Key and his wife Mary were placed in a crypt in the base of the monument. The Francis Scott Key Bridge between the Rosslyn section of Arlington County, Virginia, and Georgetown in Washington, D.C., and the Francis Scott Key Bridge, part of the Baltimore Beltway crossing the outer harbor of Baltimore, Maryland, are named in his honor. Baltimore's Francis Scott Key Bridge is located at the approximate point where the British anchored to shell Fort McHenry. Key was inducted into the Songwriters' Hall of Fame in 1970. History of "Francis Scott Key"
This page was last modified on 24 April 2017, at 22:47.